The first posts on my blog were made HERE on the 13th of August 2009. I started out with excerpts of AHTM, then known as Not the End of the Road. I had no idea I would publish, until I found out after a few months that sharing the story online ruled out conventional publishers. I was also really encouraged by how all those who read it reacted, both good and bad. Their feedback led me to brush up my writing and to really polish the manuscript. It has been a roller-coaster of a year and I can honestly say that Myne Whitman today is just because of this blog and everyone that supports me. So for my blog anniversary, I plan to do something special for the followers of my blog. 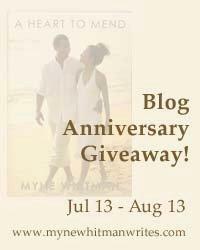 From today on until August 13, 2010, you can enter my blog anniversary giveaway and also invite others to take part. You can copy the HTML under the button on the right and put on your sidebar. Five lucky winners will each win an ebook copy of A Heart to Mend. All five will also get $10 gift cards on Amazon.com or Amazon.co.uk. 1. You must be a follower of Myne Whitman Writes. 2. Leave a comment starting with ENTRY and let me know what you'll like to see more of here on Myne Whitman Writes. The winners will be selected via a Random.org widget which I will put up here on the blog on blog anniversary. I will also publish the names of the winners on August 13 and they will then have one week to email me so I can forward their prizes. +2 blog post on your blog. Please leave the links to your extra entries through the last two ways so I can check them. Links will be verified for the extra entry.